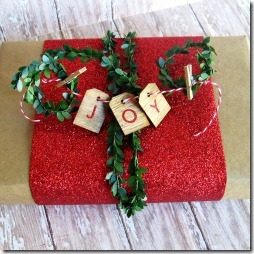 The possibilities for a gift wrapping post title are endless. I never said the titles would be good…..just endless. No eye rolling or groaning please. Ummmm….I haven’t really turned over that new cooking leaf yet. I wish my grandmother had a sugar cookie recipe. Then I could link it up here. But my grandmother favored pizza rolls and clementine oranges. So I used the next best thing…..break apart sugar cookies from the aisles of the grocery store. Each tag is 1 and 1/2 cookie square. Roll out dough in shape of square until it is about 1/2 inch thick. I bought my stamps at Hobby Lobby. The simpler the stamp the better. Stamp cookie with new unused rubber stamp. (I washed my stamps first). Make hole for ribbon (I used the end of a mixer beater). Cut away excess dough from edges to form a square. Bake cookies according to package directions. Take the cookies out of the oven and RE-STAMP them again while the cookies are still warm. All I ended up with was puffy cookies that had absolutely no idea what day to open a present. And then a light bulb went off. And I tried stamping the fresh-out-of-the-oven cookie. Success and edible cookie tags were mine. And that my wonderful friends…. PS So sorry….I couldn’t resist one more. 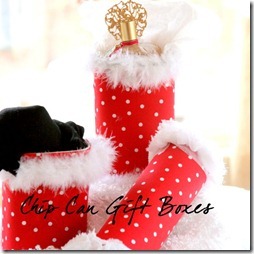 PPS For more gift wrapping inspiration….check out these fun ideas from my co-hosts. Just click on each picture to take you to the project! Very clever! I am sure you must have had many quality control helpers in your kitchen! Fun project! Have a super day! Genius KariAnne!!! @ Sally--Hobby Lobby :) Merry Christmas!!! Wow! What a clever use of a stamp...very fun! Enjoy your blogs and humor! Cute & tasty idea! These wouldn't last until Christmas with my hubby and kiddos around. =) Thanks for sharing the fun! What a "sweet" idea! My dogs would eat them off the packages though! Merry Christmas to you and your family! 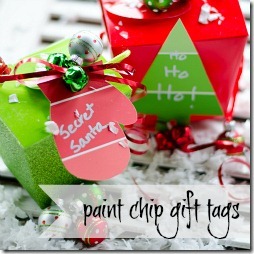 I love your cookie tags, great idea and thanks for working out all the details for us! The star spangled banner must have worked, I will have to try that too. You are a creative genius!!! Those cookie tags blow my mind!!!! Your home is stunning. Your humor is wild and wonderful!!! Merry Christmas and happy and healthy New Year!! I'm so thrilled I fell upon this blog. I'm not going anywhere! I Just LOVE it~ they are such a creative idea!!! Seriously?! Is there anything you haven't thought of?! Cooke gift tags?!?! These are fabulous!! Cute & delicious....I LOVE it! You made my day, KariAnne!!! What a great idea :) And have I told you lately how much I love your sense of humor and writing style? Love this idea - and thank you so much for figuring out all the kinks for us! Great job lady and fun to hang out with you today! Karianne! I don't have time for all of this marvelousness!! (<-- I think I made that word up.) I can barely accomplish everything else that I want to do this Christmas and now I have to go do this. No really. I *have* to do this. So creative. Pinning! Cute, cute, cute, cute, CUTE!!!! Love it!! Too cute Karianne! Pinning for next years ideas! And since I'm headed to hobby lobby today you know you just added to my shopping list!!! Oh what an awesome idea! I can see I need to go to the store tomorrow and head right to the cookie aisle! Wonderful! Karianne, if you could bottle and sell you inventiveness, you would be a billionaire! Only you! So so clever and adorable! this is too cute for words my friend! sending you tons of hugs and much love this holiday season.